Certified Child Life Specialists (CCLSs) work with your child's healthcare team to reduce the distress associated with treatment and to create a more positive experience for your child and family. Certified Child Life Specialists are educated in the psychosocial care of children and the developmental impact of illness, injury, and hospitalization. As integral members of multidisciplinary healthcare teams, child life professionals support pediatric patients and their families by working to reduce the fear, anxiety, pain, and suffering associated with illness, injury, and medical treatment. They use therapeutic play, preparation for procedures, and education to make potentially traumatic experiences less stressful. 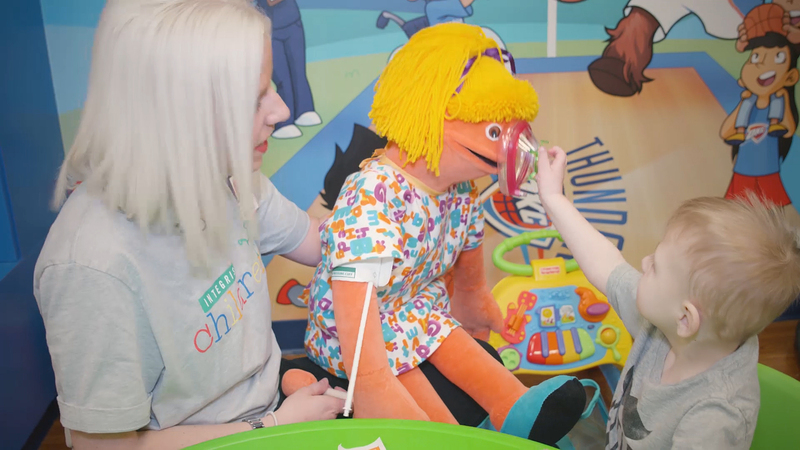 As a result, Certified Child Life Specialists increase patient satisfaction and contribute to improved healthcare experiences for the entire family. It can be scary for any child to be at the hospital. INTEGRIS Children's certified child life specialist, Ashley Ochs, steps in to help our tiniest patients cope to ease their minds. We are a 26-bed general medical center and surgical unit offering children's hospital services from birth to 18 years of age. Pediatric critical care is provided by a highly specialized group of nurses and physicians trained to care for the critically ill child.